The Moon, the Elephant and the Atlas. I’m still here, and I’ve not been idle. What I’m sharing with you today is some background info on some amazing and beautiful creatures that I have the good fortune of having the pleasure to embroider for a lovely private commission I’ve landed. I am creating a framed piece depicting 3 of the most beautiful moths in nature. It’s funny – when I decided to start accepting commissions I was very clear I didn’t want to be an ’embroiderer for hire’ and would only accept work on the basis that it inspired me; as such I would never do butterflies. But moths? They are of the night. 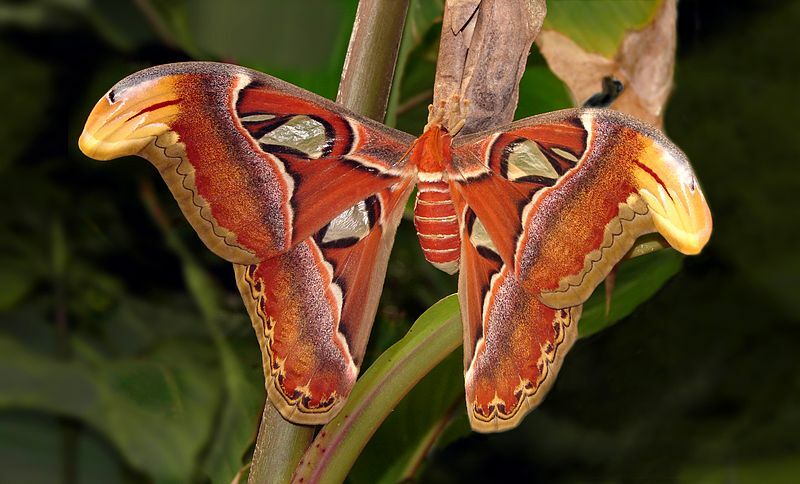 Atlas moths are said to be named after either the Titan of Greek mythology, or their map-like wing patterns. 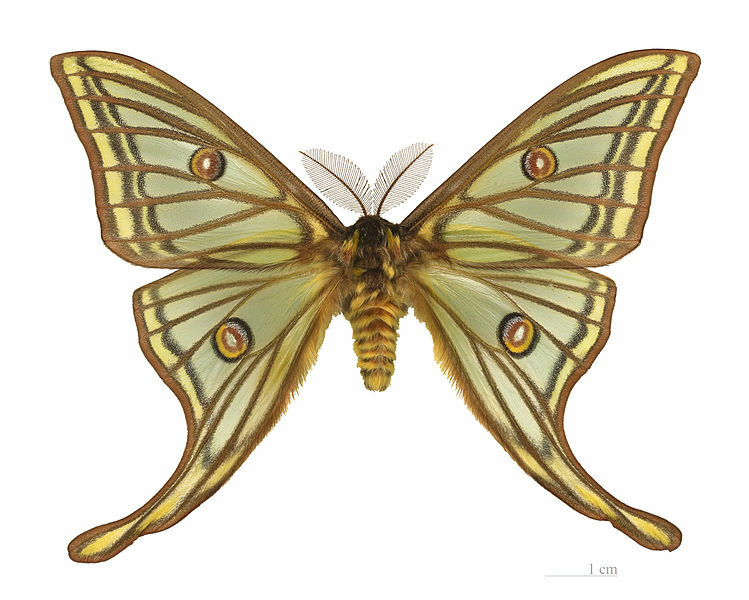 In Hong Kong the Cantonese name translates as “snake’s head moth”, referring to the apical extension of the forewing, which bears a more than passing resemblance to a snake’s head. 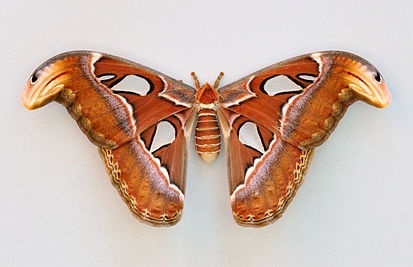 In India, Atlas moths are cultivated for their silk in a non-commercial capacity; unlike that produced by the related Silkworm moth (Bombyx mori), Atlas moth silk is secreted as broken strands. This brown, wool-like silk is thought to have greater durability and is known as fagara. Atlas moth cocoons have even been employed as purses in Taiwan. There’s something beautifully poetic about me using silk to depict this great beauty, knowing this bit of trivia. 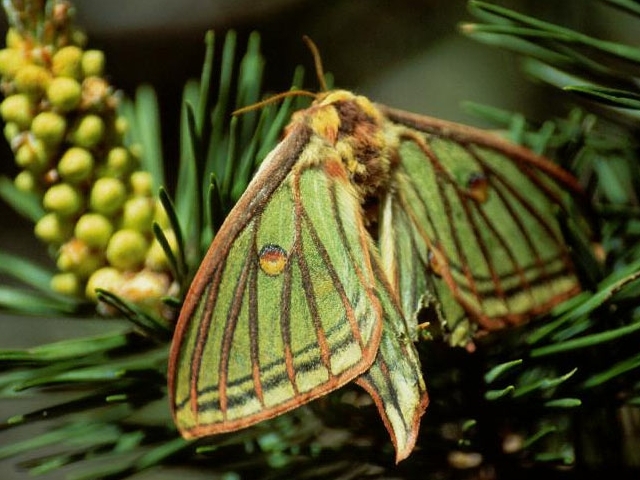 Unlike it’s tropical cousin, above, this moth is native to continental pine forests in mountainous regions of Spain, France and Switzerland, and due to its very localised distribution it is protected by law in the first two countries. At the end of April and beginning of May the moth begins to hatch after overwintering in the cocoon. After copulation the female lays about 100 to 150 eggs on the favoured foodplant, pines. The larva hatch after 1 to 1.5 weeks and begin to eat from the very hard pine needles. The Spanish Moon Moth is widely regarded as the most beautiful example of moth in Europe and is arguably the most beautiful in the world. The ground colour of the breathtaking adult is a type of metallic, pea-green, broken up with defined, reddish-brown veins. Believe it or not, the final moth is found in the UK as well as across Europe, Russia, and into China, northern parts of the Indian subcontinent, Japan and Korea. 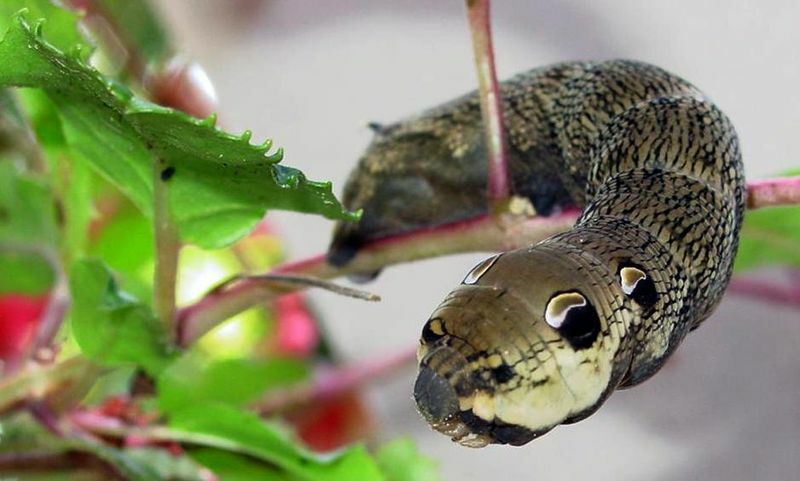 Deilephila elpenor, AKA the Elephant Hawk-moth. The larva is about 75 millimetres (3.0 in) long, green and brown in colour. Like most hawk moth caterpillars, they have a backward curving spine or “horn” on the final abdominal segment. The anterior of the caterpillar appears to have the shape of a trunk-like snout. It is this elephant look, rather than its large size, that gives the moth its name. When startled, the caterpillar draws its trunk into its foremost body segment. This posture resembles a snake with a large head and four large eye-like patches. Caterpillars are preyed upon by birds, but these shy away (at least for some time) from caterpillars in “snake” pose. It is not known whether the birds take the caterpillar to actually resemble a snake, or are frightened by the sudden change of a familiar prey item into an unusual and boldly-patterned shape. 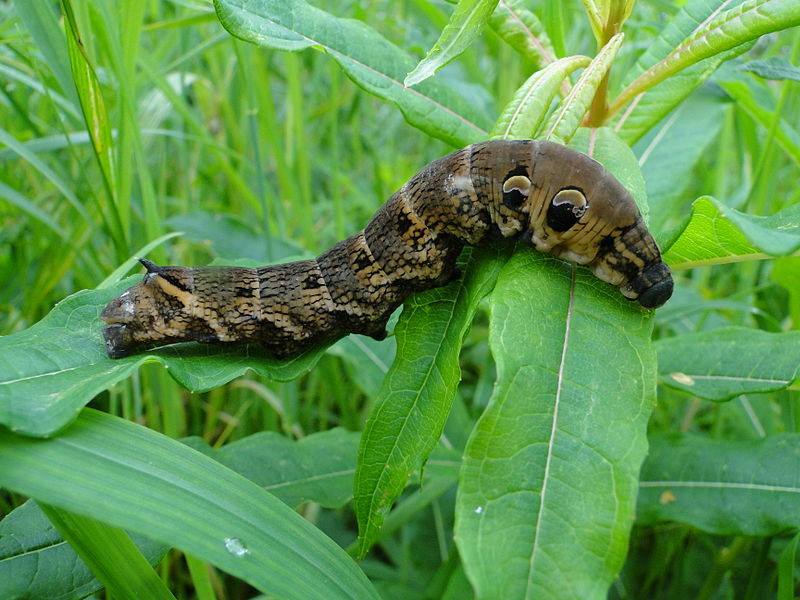 The preferred food plants of the caterpillar are willowherb (Epilobium) and bedstraw (Galium), though it will also take fuchsias. Looking forward to sharing my work in progress on this one! We found a elephant moth caterpillar In our garden in Boston Linc. Wow! 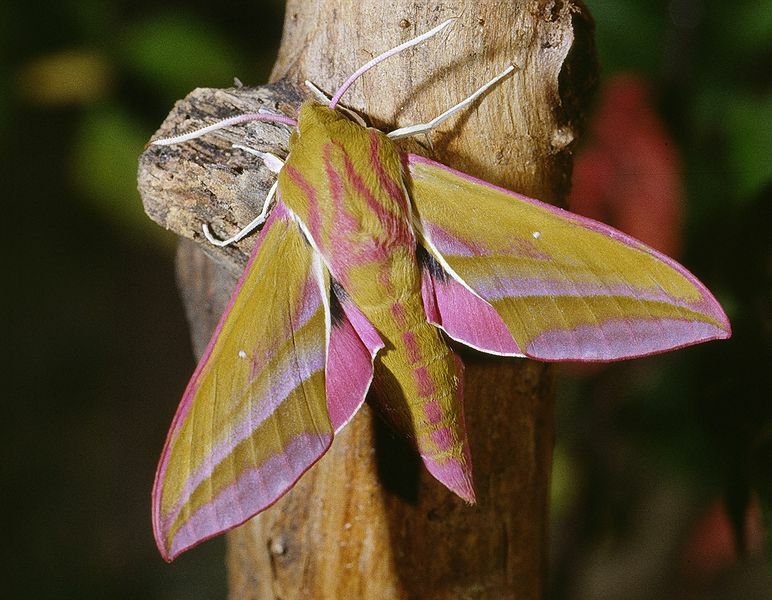 We have recently found one of these moths in our garden how can something so ugly turn into something so beautiful?